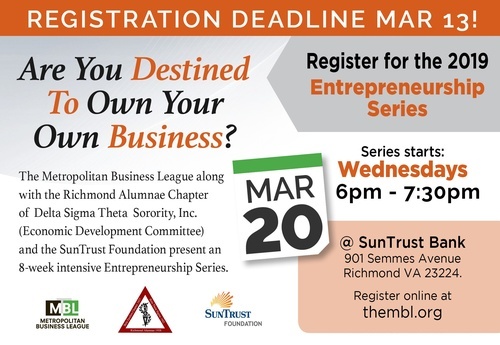 The Metropolitan Business League along with the Richmond Alumnae Chapter of Delta Sigma Theta Sorority, Inc. (Economic Development Committee) and the SunTrust Foundation present an 8-week intensive Entrepreneurship Series. During this series participants take their ideas of entrepreneurship and turn them into business plans that can be used to start their business. The series highlights different topics every week, and allows the future entrepreneurs the opportunity to meet different people in different fields that will be vital to the success of their business. These entrepreneurs have the opportunity to meet bankers, lawyers, small business associations, government aid organizations, and more. Each participant is only allowed to miss 2 classes in the series. At the end of the series, a culminating event takes place and each person receives a certificate of completion.